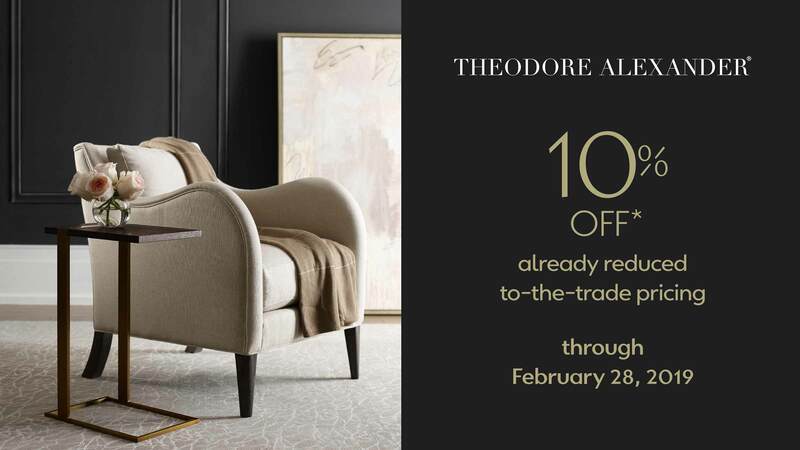 Save 10%* on already discounted trade pricing on all Theodore Alexander products. * On all Theodore Alexander item orders placed January 21 - February 28, 2019. Not applicable with any sales items, pre-existing orders, or other promotions. Does not apply to shipping or handling. Must request discount at time of order. 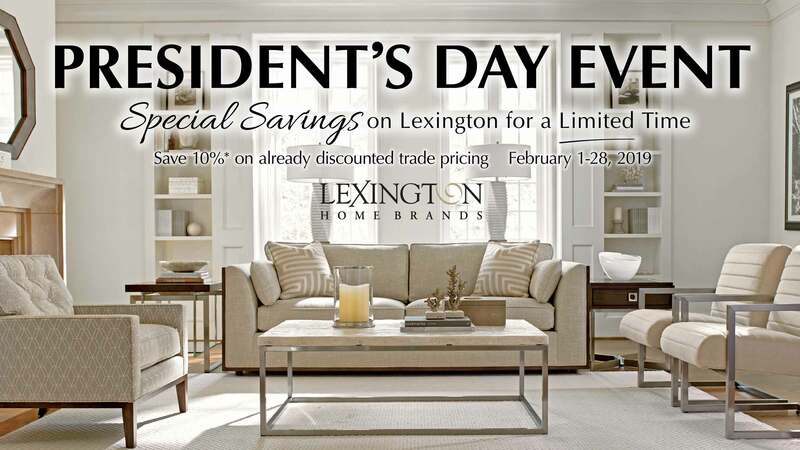 Save 10%* on already discounted trade pricing on Lexington Home Brand products. 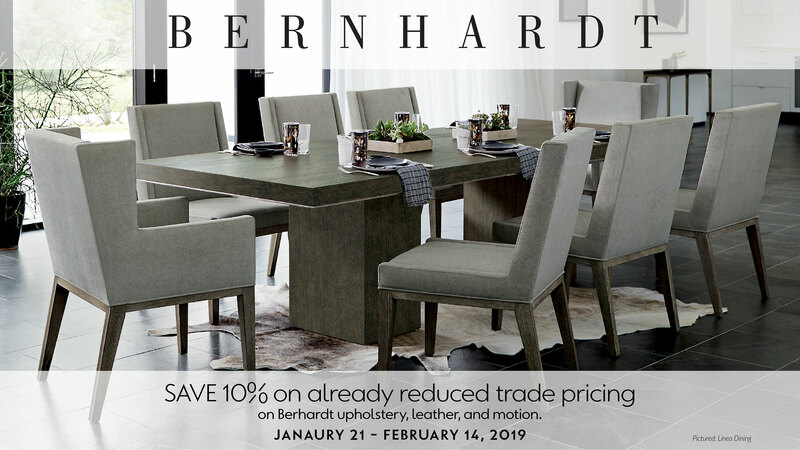 * On all Lexington Home Brand products (except Married Cover Special Priced Upholstery, PDS, Select Seating Program Container-Direct orders, Artistica and Stock orders) ordered during February 2019. Not applicable with discountinued specials, any pre-existing orders or other promotions. Does not apply to shipping or handling. Must request discount at time of order. 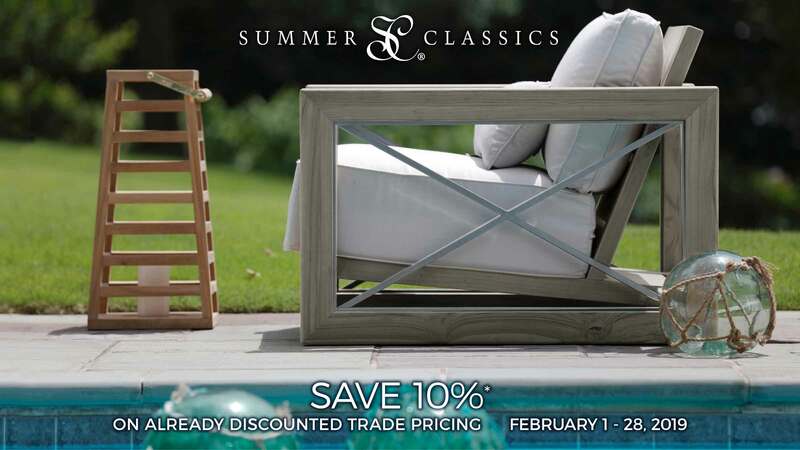 Save 10%* on already discounted trade pricing on Carson by Marge Carson wood products. 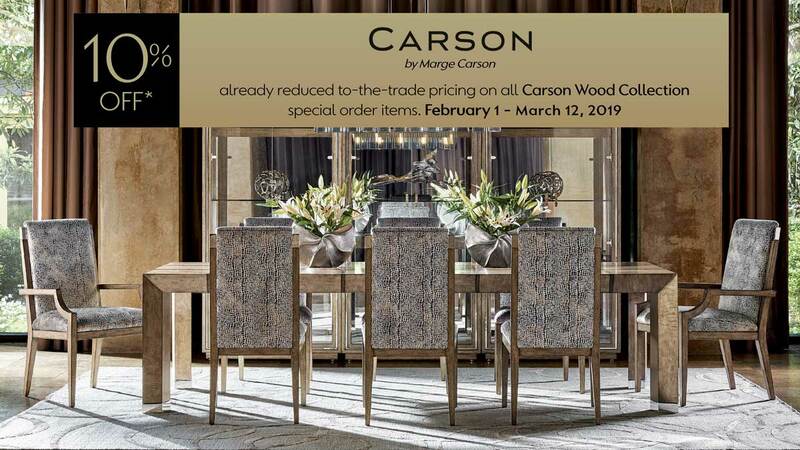 * On all Carson Wood Collection item orders placed February 1 - March 12, 2019. Not applicable with any sales items, pre-existing orders, or other promotions. Does not apply to shipping or handling. Must request discount at time of order. * On all orders placed February 1-28, 2019. Not applicable with any sales items, pre-existing orders, or other promotions. Does not apply to shipping or handling. Must request discount at time of order. 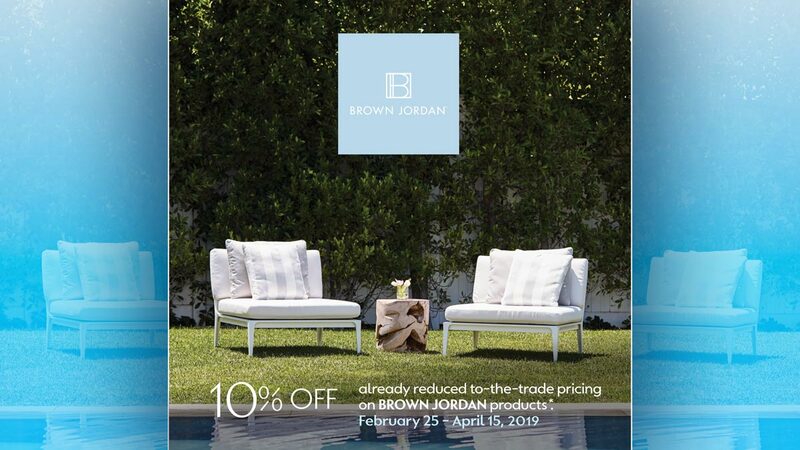 Enjoy an extra 10% off* already discounted trade pricing on Stanley and Stone & Leigh. * On all orders placed between February 14-26, 2019. Not applicable with any sales items, pre-existing orders, or other promotions. Does not apply to shipping or handling. Must request discount at time of order. 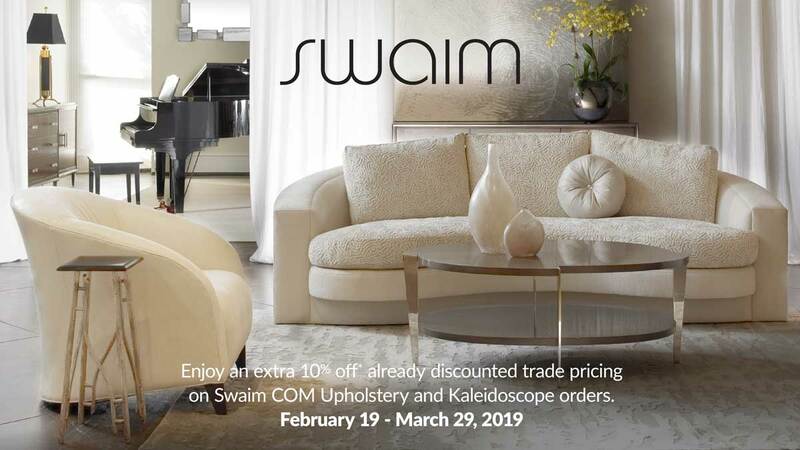 Enjoy an extra 10% off* already discounted trade pricing on Swaim COM Upholstery and Kaleidoscope orders. * On all Swaim Upholstery and Kaleidoscope orders placed February 19 – March 29, 2019. Not applicable with any pre-existing orders or other promotions. Does not apply to shipping or handling. All orders must be with a COM fabric. Must request discount at time of order. 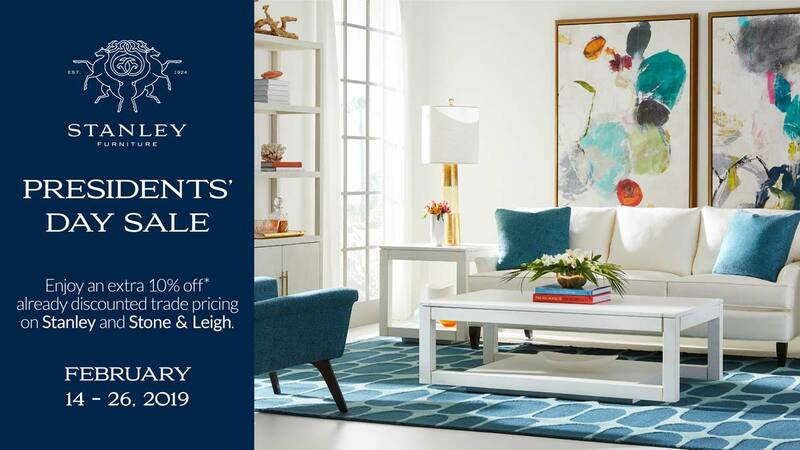 Save 20% off* already discounted trade pricing on the David Francis Furniture Chippendale collection. 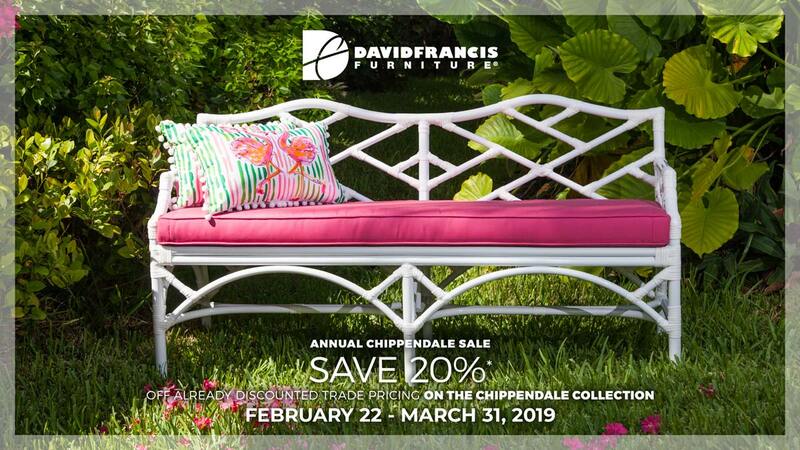 * On David Francis Chippendale collection orders placed February 22 - March 31, 2019. Not applicable with any sales items, pre-existing orders, or other promotions. Does not apply to shipping or handling. Must request discount at time of order.